The last participant in Himavunta scene. One of the good character found in many folk tales. A pointed chin, a funy moustache and a bushy beard plus a slight smile, convey a quizzical look of Zaw-Gyi that readily win love of very one. He is dressed in red, wearing along and flaring robe trimmed with gold, a red cap on his head, red slippers (not red here). Trousers under a tucked-up pasoe (not here). Unlike the religious hermit, this magical and mythical figure is believed to enjoy an ascetic life in the wood. He would pass time busy with his philosopher’s stone, cpable of making many ciracles with it. He would turn a stone into hold or a dead to live, he would relieved his loneliness by playing with nymphs created, with the touch of his magic stone or staff to fruits of a certain vin. He would think of saving good folk in troubles, he would seek and collect herbs and grind medical concoction, then he would offer these to the helpless who are in need of it.His red stuff is magic as well! Prodding with it, he might turn one to anything as he wishes. He could fly throuhg air or pass through earth. He could transform himself into another form. There’s be no end about his mysterious power. His dance steps and acrobatic leaps are fast and complicated. 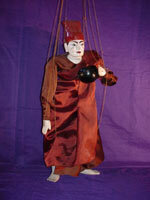 Any puppeteer who handle this mariontte well is regarerded as a master of art, able to handle any puppet. 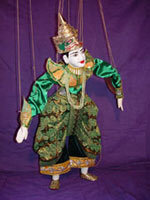 Thus to be called a good Zaw-handler is highest praise for a puppeteer. Belus play in Himavunta scene. In many or 447 Jataka Tales Belus play villainous role. The ogre dance is mostly a show of evil power and strength, and the ominous music combine with stalking steps, creates a most chilling mood. The dance is accompanied by a characteristic drum beats known as “ka-roung”. The music would arouse and exits heart beats in the audience. Another demon would appear on the opposite end, performing the ritual. later finding rivals, they would stage a fight and make chase. The music is now more. Loud and quicker representing a decisive final stage. One would mount another and even gets locked for a time hanging in the air. And at the end, each would enter with a somersault to the back stage. The city ogre’s headdress is topped with a jeweled spike, the jungle ogre’s with a plumed crest. The city ogre will of course stand on the right side of his less noble companion and they are carrying short sward (Thanlyet), one of the five items of the Burmese king’s regalia. 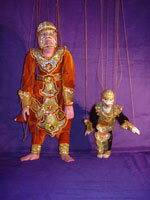 Both puppet are identical in face, build and decorations. Protruding snout provided with fangs and grinning teeth and starry eyes convey a sardonic expression. This would surely attract and fascinates, clever youngsters among the audience, while timid one would be scared. 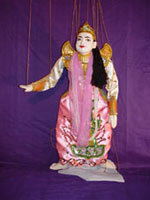 This puppet can be used for both Votaress and handmaiden, for they are almost identical with the exception of few changes of costumes. The Votaress puppet is always dressed in red, the favourite colour of nats, her hair flows down, and a band of red silk circles her brow, two short ends fluttering over the ears. A long silk scarf is tied around her torso, knotted on her bosom. The maiden doesn’t wear red, her hair flowing down, there are no head bands (or) scarves across the bosom. 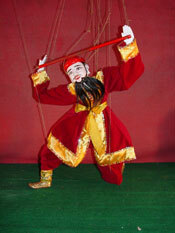 The handmaiden dance is categorised into twelve parts of that must be mastered by both human dancer and puppeteer. 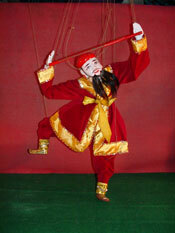 This is also one of the ritual dances of the live drama, danced by a veteran puppeteer. Votaress is a fascinating part of the ethnic scene of Burma, a medium possessing of such a beautiful ‘butterfly’ or soul that a nat had taken her for his wife. She may have a mortal husband, but her first duty is of course towards her spiritual spouse, who will through her prophecy the future of her clinets. 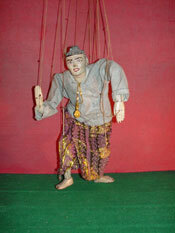 This is one of the most difficult marionettes to handle. Since she usually has the most strings, up to over thirty. 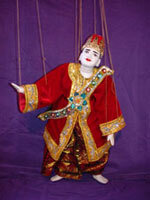 One puppeteer usually handles princess, Votaress and handmaiden. 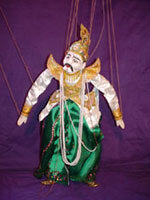 In jataka plays, where monkey is a member of plot. 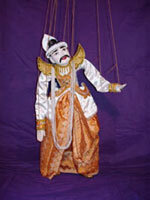 As Hunman in Ramayana puppet play which is rarely staged. 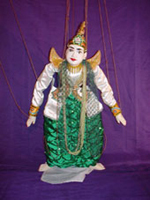 A characteristic music played for this dance would be easily identified by the Burmese audience. The dance is a wild one the monkey plays half bent facing direct to the audience, with dangling limbs and tail. The only occasional movements are a few nods and shakes head and fore head as if to grasp for banana, his favourite fruit, or to make a salute. While the monkey is dancing two ogres ( belus ) would appear on either side of stage an start a war dance. He usually weals a few human garment over his furry velvet body. The spins string is short. So that he swing forward. The monkey make his departure by swinging off the stage. King of serpent in many if 447 Buddhist Jataka tales. A character in Himavunta. Scene in which it fights with gallon (or) Garuda, king of the birds. Naga is a Pali word for a mythical serpent. The body is made up of the tubular cloth tapering to the tail-end. It’s filled up with very fine saw- dust. King of the bird in many of 447 Buddhist Jataka tales. 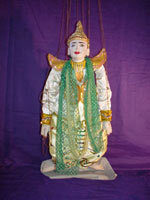 A character in Himavunta scene in which it fights with Naga, king of serpents. Mythical creatures and they have magical power to turn themselves to human form, crown on their heads for identification. A Garuda has a bird’s head, human body and hands, with wings attached and talons. 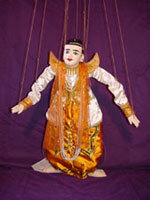 The romantic hero, the prince- puppet is sometime known as ‘soft Prince (Minth – Nu), in accordance with his singing / dancing role. In every Burmese drama, a compulsory scene is the dance dust, which usually take place in the forest. The prince and princess may be in exile, due to the wiles of a jealous step mother queen, or the prince might be returning from Takkasila, after learning the 18manly arts, winning the hand of the instructor’s daughter as best student. Or perhaps the prince has lost his way while hunting. The dress, both jacket and sarong is a superb embroidery of best craftsmanships. A cross shaped embroidered chest piece is ‘Salwe’, a royal ‘correctly’ tucked up to the waist with the terminal piece hanging down from it. This is the only specimen where a gents’ sarong is correctly dressed close to tradition. The Royal stallion for the king and nobility. It’ll be necessary to write a little about this to enable one to appreciate the important role of this horse puppet. According to Burmese ancient belief handed down from generations, the world was destroyed and create three times by fire, storm, and Rain with the appearance if 7 suns. Fix devastated all on earth and storm swept away the ashes and everything left, followed by torrential Rain. If raised the water level. So much so, that it reached the highest celestial. Brahma’s abode. The puppet play would start with the clashing of the cymbals seven times, followed by the sound of a large gong, and ended with rumbling and rapid thythm of drum, this sequence is repeated Symbolising the chaotic events. After this, tranquility and peace came to earth. 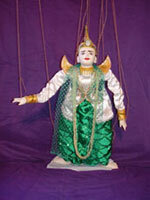 Now a Nat – gadaw puppet would come out and dance singing in praise to unseen Devas or Nats of and locality around. She would request a favour from all, such as the Tha-Gyar-Min, king of the celestial beings, the importance personate from 37 Nats and finally the audience. After the Natagadaw enters, a new world is supposed to have been ereated first with the appearance of the “Horse Constellation”. This is symbolized by the horse puppet, flying in over the back drop, and discerns on to the stage. Finding a vast expense of earth, it temps to gallop the whole length, represented by the stage, 3 times. The music is “Myint-Det-Yodaya” (or) ‘The Horse Trot’ in which the drums and clapper are played with a rhythm like the sounds of hooves. With the end of music, the Horse leaves the stop by galloping over the back-drop. After this, the Monkey, the Tiger, the Elephant, the Demons, the Zaw-Gyi (Alchemist) and the fighting of Naga and Garuda would appear in succession to complete the Himavunta scene. Princess role in duct dance. A Nat Kadaw or a Votaress or a Medium, with a red turban around the head and her hairs flowing down. An Apyo-daw(or) maid or honour. She dances without red turban, but hair flowing down behind. Her face always make beautifully sculpture and painted. The jacket is most opulent, heavily embroidered with silvers, tinsels, and beads. After all her charming beauty is beyond description. She is dressed also with elaborate imitation jewelleries on her neck and breast. Her little comb pinned into the hairs is studded with diamonds! The Prine Minister (or) Nan-Yin-Wun. In Burmese, They all are generally call ‘Wun’ (or) ‘Burden’ meaning those serving high duty or undertaking burden of state. The two senior ones usually dress high hat of velvet red, called ‘Bong’ baned with gold. They wear red and green long robes open at the front, edged again with gold and jewels, and silk jacket and ”pasoes” (or) sarong. This sarong is a long piece of cloth. Prime minister with red hat usually wears a green robe and has to sit close to the throne or ‘Nan’ and so called ‘Nan-Yin-Wun’ the minister closer to the palace. Next to him is the home minister, dressed in red hat and robe of any colour as specified by the kings order and silk jacket and pasoe. The two junior members wear similar long robes. But the head dress is different from senior ones. A white piece or rolled-up cloth is circled around the head with 2 ends tucked behind like a rabbit’s ears. The king used to have a similar head dress of white cloth, but with a single rabbit’s ear at the back. 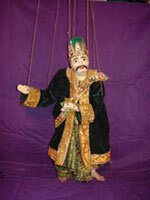 Traditionally in a puppet show, the ministers are narrator of the plots going to be unfold. From them the audience come to know about the foundation of the story usually are from 447 Jatakas of Buddha’s previous lives. Astrologer, interpreters of dreams and Omins. Master of ceremony for auspicious. In drama, They are much needed villain. 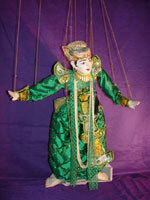 The Royal edit of the early 19th century set the mandatory number of marionettes at 36, their identities are not known to have been listed. In time, however, the accepted number lesser to 28, commonly known to symbolise the 28 ‘physical bodies or element’ that inhabit 31 ‘towers of existence’. 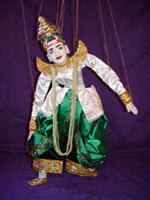 In some plays additional puppets are needed and added without qualms. The rest of the puppets, such as the Old Couple, Villainess, Queen etc., are optional, but it is normal for a troop to have all on hand, and even two(or) three sets of the main characters are kept. (a) Than-cho’, one who speak sweet. (b) Than-Pyet, one who speak jokes. (c) Lu’-Shw’in-d’aw, one who amuses others. Funny face fits its role. Daw Moe, the wife of U Shwe Yoe in the conical dance. 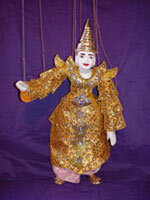 The conical dance of U Shwe Yoe and Daw Moe is a popular item among the country folk. This dance is always performed to make amusement by village lads in procession at festival. Wimala Daywii, the queen of Nagar Min, who wanted the heart of Widura Pandita. Ahmatgadaw Ahnorzar Daywii the wife of Widura Pandita. The guardian spiritual goddess, who was the ex-mother of King Kawrabya in his eighth existence. One of the Minister of King Kawrabya. Widura Wise Sage, who was a Main Character of the whole Story. King Waruna, King of Dragon (Nagar) who donate his precious ruby necklace to Widura wise sage. 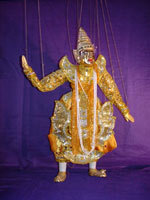 King Garuda, who donated the most fragrant one thousand flowers to Widura wise sage. King Kawrabya who enjoyed gambling dice. Knnaka Horse, belonged to the Ogre, Ponnaka. Ponnaka, Mighty Ogre who fell in love with Eirandati, the daughter of King Waruna (Nager Min ) . The heir apparent to the throne, who fled for the forest to avoided the Possible threat of a minor queen of his father king. Younger brother of Prince Rama. The monkey warrior & is small in size due to a Hermit’s curse.